Sure, you could easily buy frozen pizza at the store. But trust us - your family is sure to like this easy-to-make homemade pizza better. 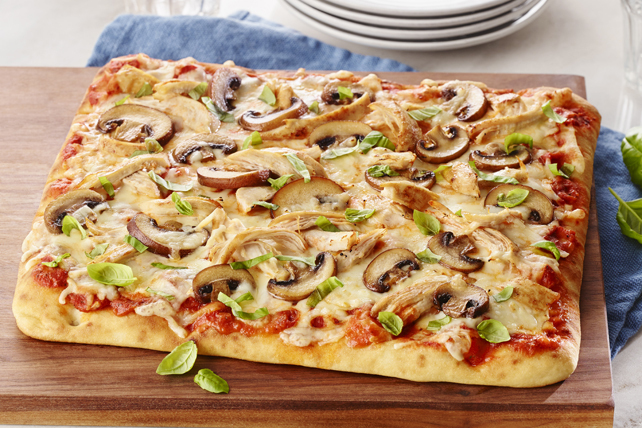 Spread flatbread with pasta sauce to within 1/2 inch of edges; top with cheese, chicken and mushrooms. Bake 10 to 12 min. or until cheese is melted and edges of crust are golden brown. Sprinkle with basil. Prepare using 1 refrigerated ready-to-use unbaked pizza crust (12 inch).